After a splendid curry in Ross and an "interesting" drive along Welsh back roads (that seemed more like rivers), we arrived at a rather damp Woodlands, and it continued to rain hard all night. 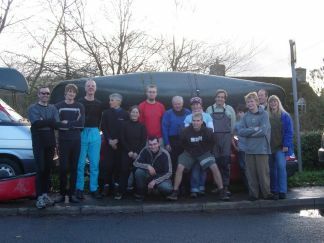 We were a party of seventeen: Kieran, Simon, Rob, Anna, Gabriel, Hayden, Russell, Nick, Joe, Ruari, and myself in kayaks; Penny, Philip, Kate, Thomas (Beaumont, who had kindly shuttled Rob's kayak for him, and also gave him a lift back to Oxford on Sunday, since poor Russell had to travel back to work on Saturday after paddling!) 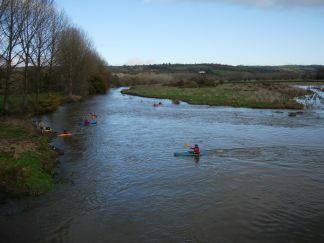 and James in opens; and Jane (not paddling, but extremely welcome since she was shuttling and taking photos). On arrival, we discovered that Kieran had bravely stepped in since Pete Farmer was unwell (and indeed because Bob couldn't make it either). So, it was quite an exhausting day. 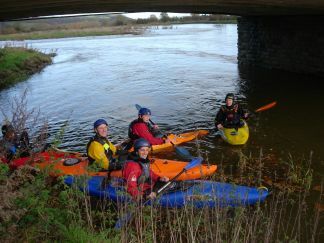 In fact, I have it on good authority that the water levels weren't the only thing of record-breaking potential - apparently it's rather unusual on a kayaking weekend for everyone to be in bed by 22:30! On Sunday morning the clouds cleared, and we had a beautiful sunny day ahead. We again started in Glasbury and were amazed by how much the water level had dropped, as it was probably over 2ft lower than Saturday morning. 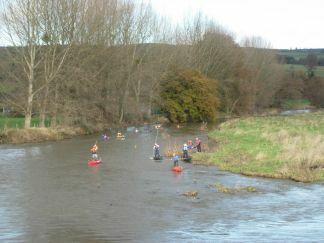 After a few exercises like avoiding obstacles (and what to do if you fail to manage that), or ferry gliding with eyes closed, we set off downstream for Hay on Wye, while Kieran drove there and walked back to meet us for lunch. Compared to the day before, this was a nice gentle bumble, although there were a few strainers to watch out for, some gentle rapids, and we all (opens too) had a go at surfing a nice standing wave - great fun! We had our picnic on a grassy bank in the sunshine, then did some throwline practice, before continuing to Hay and the drive home. So in summary: It was a great weekend with good company, and of course we all improved our skills and comfort in fast water - everyone did very well in tricky conditions - but there were also some lessons learnt... Firstly that water conditions are hard to predict, and you need to be ready to change plans. Secondly it's a really good idea to leave a car part-way. Thirdly, if things are getting hard, it might be good to back off and take another look rather than trying to force through - especially until you are comfortable with your skills. Lastly, while it's an interesting experience running rapids without a boat, once is quite enough, so I think I'll be working hard on my bracing and eskimo roll skills before next time!